It’s time to publish the statistics derived from the September Cyber Attacks Timelines (part I and part II). After several troubled months, this one has seen a considerable reduction of events. The Daily Trend of Attacks shows a strong peak at the very first beginning of the month, followed by a considerable lower level for the rest of the period, with the partial exception of the 22nd. 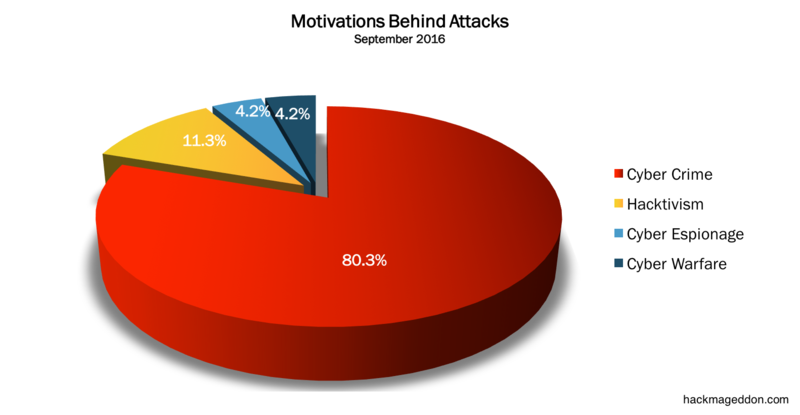 Cyber crime ranks on top of the Motivations Behind Attacks chart with 80.3% (was 72.4% in August). Hacktivism drops to 11.3% from 13.8% of August). Cyber Espionage drops also to 4.2% from 9.5%, whereas Cyber Warfare is essentially stable (4.2% vs 4,3%). For the fourth month in a row, account hijackings rank on top of the known Attack Vectors with 15.5% (was 18.1% in August). DDoS ranks at number two with 11.3% (was 12.1% in August), ahead of SQLi (7.0%). As usual, the Distribution of Targets is led by industry with 26.8% (was 27.6% in August), followed by Organizations and Governments (both of them at 11.3%, were respectively 9.5% and 15.5% in August). Single Individuals (7.0%) follow the trail ahead of the other categories. Software Companies rank on top of the Industry Drill Down chart with 15.8%, ahead of all other categories. Non-profit organizations lead the chart of the Organization Drill Down with 37.5%.